In Season Four of The Way of the Master TV program, join Ray Comfort and his faithful team as they travel across thirteen countries in just thirteen days, witnessing to individuals and preaching open-air to crowds in each country. In this 13-DVD series, you will be captivated as you see members of the team being held by Italian police, as they preach outside the famed Notre Dame in beautiful Paris, and as an angry and drunken crowd becomes unruly when they hear the gospel in Belgium. Watch as the team witnesses to the lost at Germany’s infamous Oktoberfest and in the bars of liberal Amsterdam. 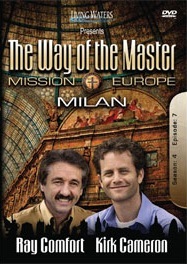 This unique and exciting adventure across the nations of Europe is hosted by Kirk Cameron. This DVD is the seventh episode of the fourth season and is scheduled to air in late 2011 on a variety of Christian networks. In this episode, the team preaches the gospel to a large crowd outside a famous Catholic church in beautiful Milan, Italy. Watch as an angry undercover police officer circles like a hungry shark before making his move. Two members were then held and interrogated by the Italian police as the rest of the team earnestly prayed—-and saw God wonderfully intervene. You will be grieved as today’s lost youth try to justify murder, lying, stealing, and adultery, and a man accuses Jesus of being involved with a prostitute, and encouraged not to worry if your “goose is cooked.” DVD includes subtitles, closed-captioning and extra features.